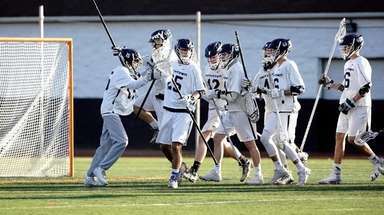 Pat McDonough scored the winner off an assist from Neil Tapia with 2:24 left in overtime to lift Islip over Comsewogue, 5-4, yesterday in Suffolk League III boys lacrosse. Sam Lepore made 12 saves, including a stop from close range in overtime that gave Islip (1-1) the possession that led to McDonough's goal. McDonough finished with two goals and one assist. 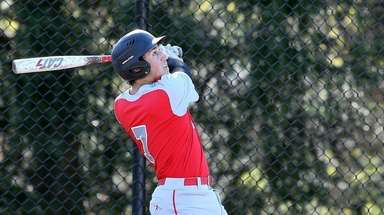 Kings Park 10, Westhampton 9: Jack Cutillo scored three goals for Kings Park (1-1) in Conference III. Harrison Bower made 10 saves, including several big ones in the fourth quarter to help seal the win. 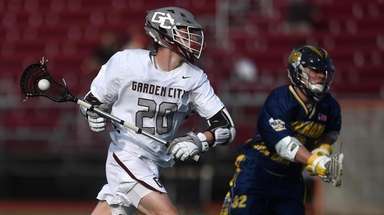 Commack 10, Friends Academy 6: Mike Paccione and Kevin Snyder each had three goals to lead Commack (1-2) in non-league. 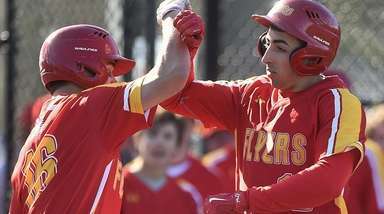 Riverhead 12, Middle Country 4: Mark Andrejack scored four goals to lead Riverhead (1-2) in non-league. Mount Sinai 12, Bayport-Blue Point 7: Danny Bullis' four goals and two assists led Mount Sinai (1-1) in League III. Shane Walker won 14 of 20 faceoffs. Whitman 8, Patchogue-Medford 2: Anthony Palazzolo scored three goals for Whitman (3-0) in non-league. Shane Brennan made 21 saves. GIRLS LACROSSEHauppauge 14, West Babylon 12: Sydney Nino had seven goals and one assist to lead Hauppauge (2-1) in League II. Keri McCarthy added four goals and one assist. West Babylon's Sam Geiersbach had seven goals and four assists. Ward Melville 9, Sachem East 7: Holly Regan scored three goals for Ward Melville (2-0) in Division I. Kaitlin Thornton had two goals and one assist. Hannah Hobbes also had two goals and Samantha Nemirov added four assists. Olivia Gonsalves made eight saves. Floral Park 10, Bethpage 7: Katie O'Donnell had one goal and three assists, and Jenna Orfanos and Emma Schlecter each had a goal and two assists to lead Floral Park (2-0) in Conference IV. 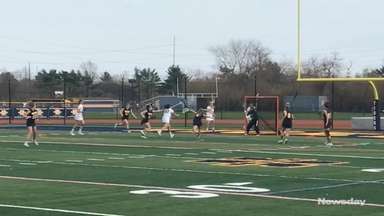 West Islip 14, Sachem North 6: Emily Piciullo had five goals and Vanessa Costantino had four goals and three assists to lead West Islip (2-0) in Division I. Emily Beier added two goals. BOYS TENNISBabylon 4, Lindenhurst 3: Kumi Chinterlapalli and Justin Benoit defeated Zack Liber and Bryan Berrent, 3-6, 6-1, 6-2, at third doubles to lead Babylon in the League IV opener. Gregory Kowalczyk defeated Alwani Amseli, 7-6, 6-1, at fourth singles. Sayville 4, West Islip 3: Andrew Hillsberg and Lucas Brennan defeated Artie Singer and Dylan Beasly, 7-5, 1-6, 6-4, at second doubles to clinch it for Sayville (1-0) in League III. Sayville's Jake Hoffman defeated Jonny Laughlin, 6-3, 6-3, at first singles. Bayport-Blue Point 5, Patchogue-Medford 2: Kyle McCrosson and Danny Anglim defeated Kevin Romanski and Rich Dougherty, 6-3, 6-4, at second doubles to lead Bayport-Blue Point (1-0) in League V.
Hicksville 4, Farmingdale 3: Akash Jha defeated Furaj Muralicharan at second singles, 7-5, 6-3, to lead Hicksville (1-1) in Conference A-III. Uniondale 4, Hempstead 3: Jeremiah Smith defeated Edwin Solis, 6-4, 6-4, at second singles to lead Uniondale in its Conference IV opener. BOYS TRACKGlenn 71, Babylon 70: Quinton Hardy won the 400-meter hurdles in 1:02.4 and the 110 hurdles in 15.9 to lead Glenn (1-0) in League VI. Hardy also won the triple jump at 36-10. GIRLS BADMINTONMiller Place 5, Smithtown West 4: Amanda Friedman and Emily Pastore defeated Megan Beloff and Liz Kratzky, 15-5, 15-7, at first doubles to clinch the League I win for Miller Place (2-1). Uniondale 4, MacArthur 3: Dajha Judge and Natalie Johnson beat Faith Gardner and Kassi O'Hara, 21-18, 21-11, at first doubles to clinch the Conference III win for Uniondale (2-0).